Thank you donors for your love and support. On my last update I told you all we didn't have a liver donor and we were working on it. Last September my father was in liver coma ICU in ILBS. He fought with the disease and was well till Dusshera so we brought him home.. But starting this October his health fell drastically and within 12 days of that he left us. Despite our best efforts, we were unable to save him. Your support ensured that he had the best medical care possible. Thank you for all the care you've shown. Thank you all the donors. We have successfully raised the operation amount and all we need is money for post care. Sorry for not updating you all, as I was busy in my college and the donor evaluation and taking care of papa. My mother was to be the donor of the liver and the donor evaluation was to be conducted in three stages. After clearing the three stages the donor was to be approved and then there was the document verification. The donor evaluation and recipient evaluation had been successfully completed but at the end of stage 3, my mother was rejected as a donor due to a complication. Since we have no other donors who match in the family and also the hospital doesn't accept donors from outside we had to postpone the operation. Currently, we are searching for donors and also papa has been registered on the list of deceased donors. I am trying my best to get a donor for him so that he can recover as quickly as possible. Please share this campaign further with your friends and family. Will keep you posted in case of any developments. Thank you once again for all the love and support you have shown papa. Would request you to keep him in your prayers. Papa's condition was deteriorating day by day. So we decided to take him to Delhi. 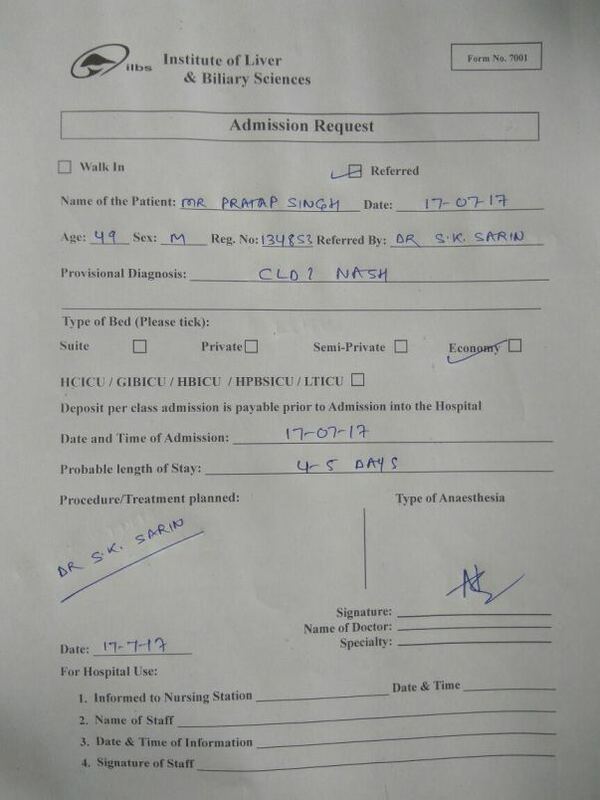 We didn't get a good response from AIIMS and Papa needed immediate care so we went to Institute of Liver and Biliary Sciences Delhi. The doctor there told us to admit him in the private ward which was too costly for us. So we decided to go back and home and raise full money and come back. But by God's grace and help of some dear friends, we got in contact with the director of the Institute and successfully have admitted my father in Institute of Liver and Biliary Sciences Delhi. I have attached all the documents on the story section. Regarding further treatment, Dr SK Sarin has said that we have two options liver transplant or T. I. P. S (Shunt). We will know which of them will be more suitable after the tests. I would be needing the money for the treatment once this is known. Thank you all so much for the support!